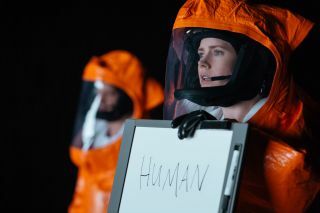 2016's "Arrival" depicted first contact with aliens and the struggle to understand and communicate with them. This year's Academy Awards may have an otherworldly bent: The sci-fi spectacle "Arrival" and the space history flick "Hidden Figures" were nominated for Best Picture, and space media made the list in other places as well. "Arrival" is a thoughtful story of alien contact based on a short story by Ted Chiang that was released in November of last year. In addition to receiving the nomination for Best Picture, the film was nominated for Best Directing, Best Adapted Screenplay, Best Cinematography, Best Film Editing and Best Sound Mixing.